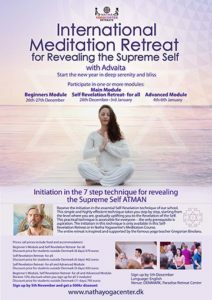 In our annual Self-Revelation Retreat over the New Year period the participants are offered the unique opportunity to be in silence; without phones, emails and any external distractions, creating all the conditions to focus internally and discover the genuine treasures of your own inner universe; to explore the mysteries of your soul, to awaken your spiritual heart and discover your divine immortal self – Atman. Begin the new year in deep serenity. Awaken your soul, go deep into your spiritual heart and its mysteries. Discover your true essence and the highest Immortal Self, Atman. Receive the initiation in the essential Self-Revelation technique of our school. This simple and highly efficient technique takes you step by step, starting from the level where you are, gradually uplifting you to the Revelation of the Self. This practical technique is accessible for everyone – the only prerequisite is aspiration. The initiation in this technique is only available in this Self-Revelation Retreat or in Natha Yogacenter’s Meditation Course. The retreat is guided by Advaita Mihai Stoian, who has mastered the secrets of long meditation through more than 20 years of intensive deep meditation training and silent meditation retreats. The retreat will take place in the beautiful and peaceful countryside of Denmark in Paradise Retreat Center. All the presentations are kept in English. The retreat will take place in three stages, in this way catering for beginner, intermediary and advanced meditation practitioners. An optional part, for those who are beginners in meditation and those who would like to have a gentle “warm up” before the actual retreat begins. In this stage there will be: Hatha yoga practise in unison – guided by an experienced yoga teacher, lectures and short meditations. All these elements provide the participants with the possibility to gradually prepare for the longer meditations and intense program of the following camp. An intensive program of meditations, lectures, guided yoga practise all with the aim of guiding the practitioner on the journey within their inner universe. This stage is a wonderful blending of theory and practise, the theoretical aspect provides the framework for the meditations, offering explanations regarding the process of entering into and deepening the meditative state. Please note that the actual meditations are in silence with the aspirant using the information he has received in the theoretical part to deepen his experience in the meditation. This stage also includes; daily exemplifications on different spiritual states offered by our spiritual guide Grieg, and personalized guidance, with answers to significant questions written by the participants. There will be special spiritual activities kept together on New Year’s Eve, and much more. The entire retreat is supported by our spiritual guide Grieg. *The prices includes accommodation in dormitory. We have few single and double rooms available at an extra cost, please contact us at natha@natha.dk for the prices. Be aware that these rooms are often booked fast. We offer the possibility as well to have accommodation in cottages on a camping area near by or bed&breakfast in the area (please ask for more information). In this case you may pay only for the food and not the accommodation in Paradise. We look forward to welcome you in the International Meditation Retreat 2016-2017!